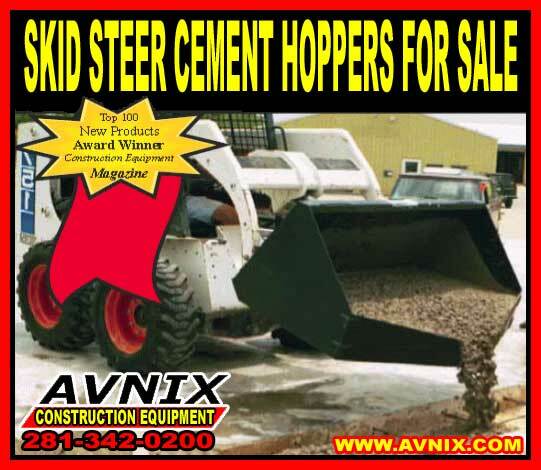 Cement Hopper For Skid-Steer Loader has no fragile cement chutes that constantly need repair, no gates to clog up with aged concrete, no hydraulics to get dirty with filth and grime. 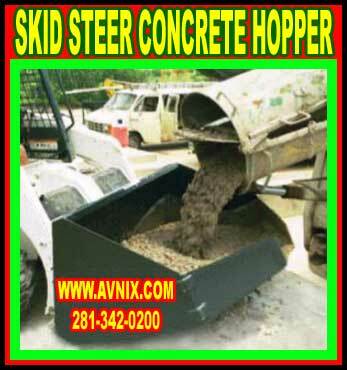 Avnix concrete buckets works better and easier to use than complex systems costing thousands of dollars. Our heavy duty cement hopers are designed to take the wear and tear of a quick moving construction work. Hard-wearing corners reinforces the bucket sides. The bottom is protected and strengthened by 1/2″ thick steel bars. Overall rugged construction guarantees reliability, pour after pour. This is an skid steer attachment you can use, set in the equipment yard, and know it will preform when you come back to use it. Economical simple, straight forward construction keeps costs low. Normally pays for itself on the first pour. By definition, a concrete hopper is a skid steer loader attachment that is used to rapidly and proficiently move concrete into tough to reach places. Since hopper has no gates or chutes, and because it has no moving parts, it offers quick unloading of cement in even the most demanding of environments. The straightforward steel bucket design, reinforced on the corners, can perform without fail under the most difficult of conditions. Because the cement hopper can access virtually any location that a skid steer can maneuver in, it allows operators to precisely place concrete where it is needed. The largest use of concrete placement buckets are found in the industrial & commercial construction industry. These skid steer attachments are regularly used for a lot of different applications in both commercial and residential construction. In building renovations, where concrete is needed in particular place, they offer a fast, handy way of doing so. During the busiest period of new constructions, skid steer cement buckets are used to position concrete in small areas that large equipment will not fit. Structures like atriums, patios, rotundas, walkway areas near buildings, and bicycle parking areas can all be built very quickly with the right concrete hopper attachment. In the residential arena, house foundations can rapidly be laid out using these skid steer attachments. Landscape design companies find them mostly useful when building hardscape structures for residential landscap plans. Examples include swimming pools, patios, and walkways. Skid steer Loader buckets are mainly useful for the pouring of ornamental concrete that is found in many home landscapes around the country. Cement placement buckets are also very useful for sidewalk, driveway, and foundation repair jobs. Once more, this is due to the capability of these cement hoppers to access places other types of equipment cannot. The cement hopper design also makes it easy to manage the amount of concrete needed to repair a section of roadway, driveway, or hardscape. Efficiency is going to increase with the acquisition of a concrete hopper attachment. With or without the use of heavier mixing or pouring equipment, a construction team can get almost anything done with this hard-wearing, reasonably priced cement hopper attachment for skid steer loader. Empty Weight 470 lbs. 625 lbs. Minimum Loader Cap. 1,350 lbs. 3,000 lbs. Caution: Do not exceed capacity of loader – Concrete weights vary – Calculate load before using.